The EnviroGro PRO CFL Reflector brings together all the benefits of a closed dual parabolic design w.. The LUMii Aerotube is the latest inline aircooled reflector. This innovative product, when used in c.. The LUMii BLACK reflector boasts dimpled wings for excellent reflectivity, light dispersion and the .. The LUMii MAXii is a simple and easy-to-use Dutch barn-style reflector. It is an open ende.. The new Powerplant Mantis Pro Adjustawing Reflector is the most versatile reflector on the market to.. 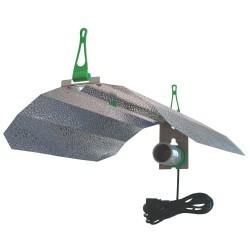 The Power Plant Ultralite Pro is a high performance, light-weight reflector with patented design. ..